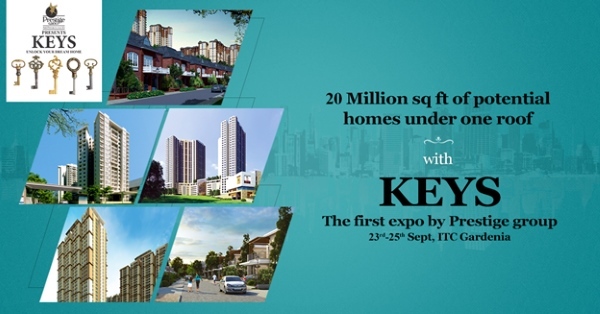 Showcasing over 40 properties across India, the real estate expo Keys by Prestige group is taking place this weekend at ITC Gardenia, Bangalore. The Prestige group, developer of several exceptional properties across South India, is turning 30 this year. In the past three decades the group has created iconic communities, which have offered world-class lifestyles to Indians. They are the people who gave Bangalore its first big mall in 2004 – The Forum – and later in collaboration with the UB Group, created the famous UB City. Their work has been appreciated as well with International Real Estate Federation (FIABCI) rating their projects Prestige Opal and Prestige Four Seasons as among the 30 best developments in the world in 1998; in 2002 Prestige Acropolis was awarded in the ‘Residential Category’; and Cessna Business Park was highly commended in the software facility category in 2004. “Euro Money Award” for excellence in real estate was awarded to them in 2005. Several more awards and path-breaking projects later, the Prestige Group was adjudged the ‘Most Promising Brand of Real Estate in India’ in 2014. It is only befitting that 30 years of such an illustrious Indian company are honoured in style, and that’s exactly what the group has planned. Taking place from 23rd till 25th September at ITC Gardenia, Bangalore, Keys is celebrating the ‘spirit of building the extraordinary.’ This grand extravaganza has plenty in store for all visitors, including special offers in all residential properties. The expo is showcasing all of their ongoing projects in Bangalore, Hyderabad, Mangalore, Chennai and Kochi, with prices which fall into budget, mid-segment, premium and luxury categories, ensuring there’s something for every pocket size and sensibility. Folks considering luxury properties should head to their Premium Lounge where special offers and opportunities await them. Over 40 properties are being showcased in dedicated stalls at the expo. All combined, Keys is where one can choose their dream home amongst an astounding 20 million sq. ft of potential homes! Go on, add Prestige to your lives! For more information on Keys, the real estate expo, please visit keys.prestigeconstructions.com. Tagged LifeSpice, Luxurious lifestyles, luxury, The Pad. Bookmark the permalink.